Back-Up Story: "The Origin of Two Face"
Buddy Blank, his grandson, Una and Karate Kid are travelling through the remains of Bludhaven in a robotic buggy, trying to discover how and why it may be the source of Karate Kid's disease. Una worries about their young passenger but Buddy insists he doesn't want to shield him from the evils of man and the future they represent. He also warns them their suits are the only thing protecting them from infection too. Thousands of miles away on Apokolips, Darkseid is playing chess with the players of Countdown and looks pensively at Buddy Blank's grandson. On Earth 8, Forerunner is given permission to kill Donna Troy by Monarch. He had offered them a deal to join him but they had refused - the penalty was death. A glowing Oan fist knocks them away and Kyle flies in rescuing Donna. Bob and Jason stand over the body of the Jokester trying to fend off the Extremists and the JLA Doppelgangers. A fight ensues and Jason is captured by Earth 8's Aquaman. Jason promptly guts him. The fighters stop and are in shock their fight has lead to a death. (Nobody cares about him but Jokester is also dead as far as we know!) Donna confronts Jason and Monarch tells her she doesn't know him at all. None of them know anything about him or what he's capable of. He promptly accepts Monarch's offer to join his army. In the Daily Planet, Forager explains if they don't act quickly and save the souls of the New Gods then all reality will collapse and the Fifth World will be born and that cannot happen. Jimmy accepts and a Boom Tube whisks them away to parts unknown. Shadowpact are trying in vain to end Mary and Eclipso's partnership. Mary believes that Eclipso is her only real friend and tries to kill Enchantress to prove it. However Blue Devil intervenes and just as it seems Shadowpact's team work might pay off Eclipso teleports them, herself and Mary away. On the island of Themyscira in a modern barracks the new recruits are bonding, they all seem to be women from the wrong side of the tracks in need of redemption. Exhausted from the swim to the island and fighting off he sharks they enjoying a much needed chill out. Athena however is not impressed. She sends them running around the island on a midnight run chased by two Staffordshire Bull Terriers. Holly suddenly realizes - this isn't a boot camp to help them - it's a prison! Two Face is the latest captive on the Marvel Comic's Genoshan style prison. He demands to know where his guards are taking him before he beats them up. Without warning they crumple to the floor and the previously invisible Piper and Trickster reveal themselves. When the Suicide Squad captured Double Down they had secretly hitched a ride and now they are also looking for answers - who are the Suicide Squad working for and what are all the abductions about? Two Face tries to split the duo apart with his own split personality but Trickster is in no mood for games. He asks Two Face if he's willing to help and Dent agrees. He reveals Checkmate is running rogue and capturing all the villains they can find. Luthor and Joker are already captive - Checkmate call it Salvation. Realizing they've made a bad move sneaking into the lion's den they promptly plot to escape, relying on the flip of a coin of course. The dumb duo escape in a truck and race into the horizon. Two Face stays behind for reasons known only to himself. The Challengers are shocked at Jason's weak character. Jason wants to be on the winning team but neither the Challengers or Monarch believe him or how they can trust him. To prove himself, Jason steals Bob's rifle and shoots Donna point blank. A horrified Bob and Kyle race to her dying body while Jason and Monarch smile over the fallen heroine. Back-Up Story: "The Origin of Trickster"/"The Origin of Pied Piper"
Harvey Dent was an abused, schizophrenic child. He was able to hide his mental state by devoting his life to law and order. He became a respected and upstanding District Attorney with an envious life. Things were looking up for one of Gotham's favorite sons until the day a vengeful mob boss hurled acid in his face while Batman watched in horror. Horrifically scarred on one side of his face the trauma unbalanced him forever. His dual personality dictated by his now dual appearance. Harvey used a scratched coin to dictate his decisions. The smooth side dictated honour and justice. The scratched side and darkness wins out. Batman is the only man so far able to stop his dark side. Main Story - 4: Now the story is heating up and one of the challengers has switched sides it's beginning to pick up in pace. Asking me just 3 weeks ago whether this title was junk I would have said a 100% yes. However this is beginning to have a much bigger impact than I thought, it's a shame it's taken till book 26. Checkmate being revealed to be the point of Trickster and Piper on the run and Athena being a makeshift prison warden is finally giving them purpose. Let's have more please. Main Art - 4: Awesome artwork this issue. Odd camera angles for some scenes but this week's art seems oddly stronger than weeks & months past. I hope it keeps up in pace as we draw closer to the finale. Back-up Story - 4: A slick and quick job. Cuts out all the history of the character and brings us slap bang into the present day. A shame it isn't too descriptive but at least it gives you the bare facts and that's all you really need. The fact it harks back to Gotham Central is a good thing too. Back-up Art - 4: The art is fantastic. Takes you back to a bygone superior art style that gives Two Face a depth the origin doesn't really delve into. Together they compliment each other beautifully. Cover Art - 4: All fours this week- what's going on! Churchill usually delivers mediocre to boring artwork as per his run on Supergirl. 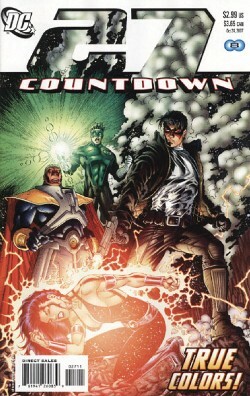 I thought it was a weird choice having him helm the covers of Countdown but this issue proves to be an outstanding one. Its more so rated highly because of the grab factor.